Summer is supposed to be a time to relax and not feel so scheduled day in and day out with your kids, but for some reason this time of year feels as busy as ever. With even more and more outings, play dates and shuttling back and forth to summer camp, I seem to have even less time in the kitchen so I always need quick recipes at my disposal that I know Kenya and Chloe will enjoy. My kids love themselves some cucumbers and so I always keep a bunch of them on hand for these simply delicious sammies. They are light and refreshing — the perfect sandwich for summer, no matter how little time you have to make them! 1. 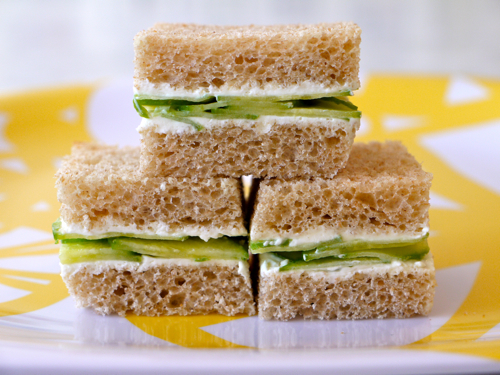 Spread 1 tbsp of cream cheese on one piece of the bread and top with thin slices of half of the cucumber. 2. On another slice of bread, spread another tbsp of cream cheese and then sandwich the two slices together. 3. Continue to make the second sammie. 4. Cut in half or quarters and serve. i just discovered this site when i was searching for healthy recipe ideas for my one year old and i am in love!!! almost makes me wanna have another so i can make the baby food lol. another great inspiration thanku weelicious! i am hooked and my daughter n husband r eagerly tasting away! Cream cheese sammies are also good with avocado spread on them. My 2 and 1/2 yo gobbles them up. Want to make it a special treat? Substitute strawberries for the cucs. My one year old can't get enough! I can't say enough about your recipes!! I have a 15 month old and he loves your food!!!! Try sprinkling some dill on the cream cheese, or you can mix it in to the cream cheese in advance with some lemon zest/juice for some added punch! A small dash of cumin if you're living dangerously! Hey There. I discovered your weblog the usage of msn. That is an extremely smartly written article. I will make sure to bookmark it and return to learn more of your helpful information. Thanks for the post. I?ll certainly comeback. My daughter loves this and wants to put them in her school lunches,my only concern is the amount of time it would sit in her lunch box before eating and the sandwich getting soggy,are there any tips you can suggest that would help keep the sandwich as fresh as possible till she is able to eat her lunch? Since the cream cheese is what is touching the bread you shouldn't have a problem with it getting soggy. And I always pack an ice pack with lunch! Recipes sound great. My grandsons luv cucumbers! I'm preparing for my 2 years old to go to \"pre-school\" in August 2013. How would a cucumber/cream cheese sandwich hold on until lunch without being refrigerated? Is that even possible? I'm looking for sandwiches that do not need to be refrigerated... the only thing I can think of is PB&amp;J and your Banana dog... Please elaborate! Thanks. Just made these so quick! my boy who doesn't like cucumber loved them!